Lippmann Holiday , Art Club Blue Glitter, Art Club Silver Hologram, the silver stars from Love My Nails Glort, INM Out The Door Northern Lights Gold and Orly Prisma Gloss Silver. I know, they're a little sloppy and uneven, I was just playing around a bit, but I think they turned out pretty cute! 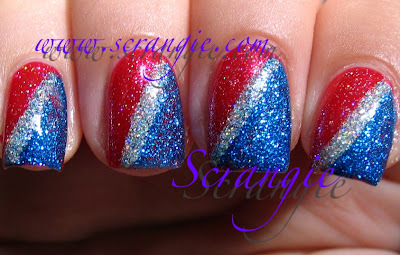 I might actually leave this on as my final Fourth of July mani. It's so sparkly, like little fireworks on my nails! If I don't get a chance to post again, I wish you all a happy and safe fourth of July / Independence Day! LOVE the one with the stars! 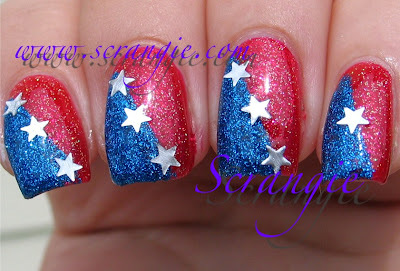 So cute and perfect for the 4th. very cute! not sloppy and uneven at all! Those are so cute! I love the glitter. They're both gorgeous sparkly designs, but my favourite is the one with stripes! I love when you post nail art! You're so good at it. Happy 4th to you too! OMG that is so awesome!!! Those are perfect. The sparkle reminds me of fireworks. That it too cute! And, I love that it's "stars and stripes..." Have a great 4th! Get me finally sorting a blogger account! Yippee! I love the first one with the stars. Very glam. At first glance I thought the stars were freehand and almost spit water on my keyboard, lol! Still a great job though, sooo cute! Two beautiful designs. I didn't do a 4th manicure. I was too aggravated with computer problems. I'm so behind in all my blog reading.